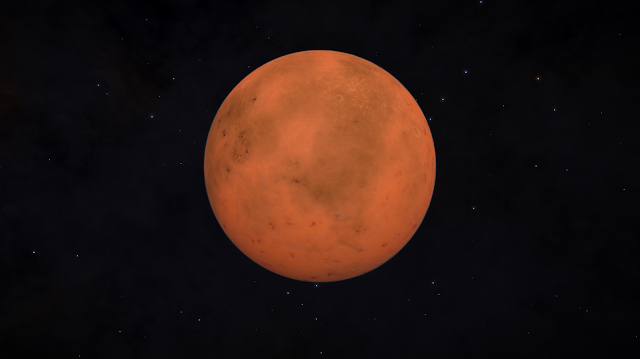 Elite Dangerous Exploration Diary: Day 30 - has it really been that long ? I feel as if I have been zapped into the future. From the restart, which seems like only a couple of days ago, I think I am now on day 30, which is pretty much a month taken on this crusade. But no worries, I have made some progress on this session. 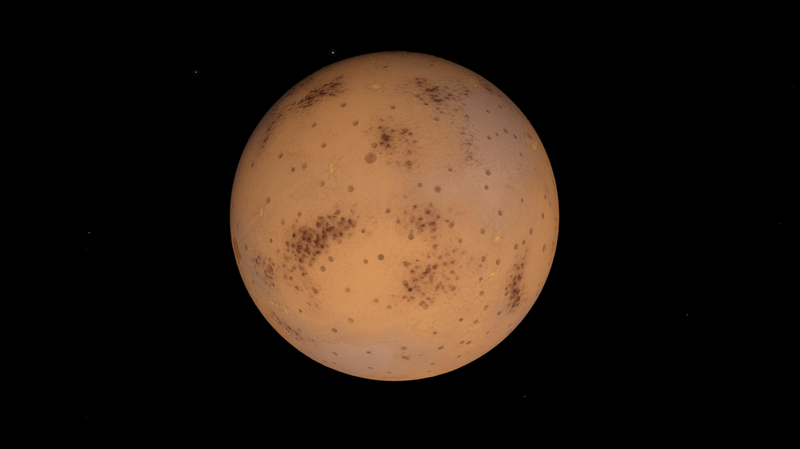 This session started in the Swoiwns star field followed by the complete traversal of the Prooe Drye star field and I am now moving across the Prae Drye star field. Some weird names there and I am sure there will be more. 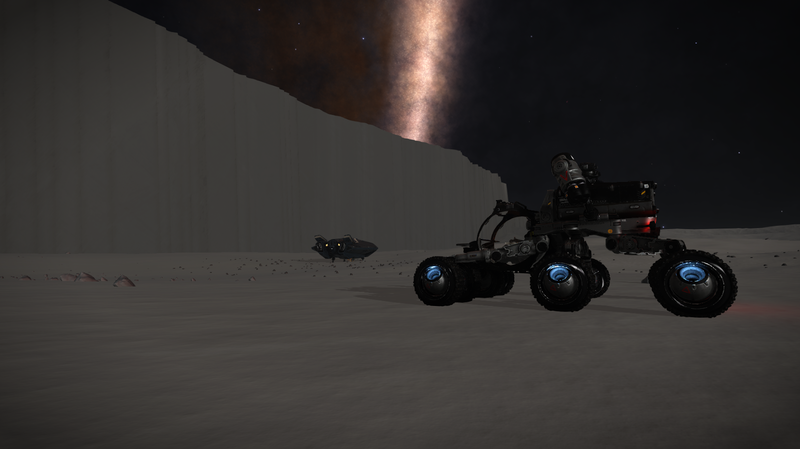 As you can see I haven't surveyed every system I have come across. Feeling the need to make progress along the spiral arm, I have skipped a few. Those systems were what I would consider to be way too spread out with only a few ice planets. Ice planets don't really help the credit gains that come from exploration, even though they are the "bread and butter" planets. 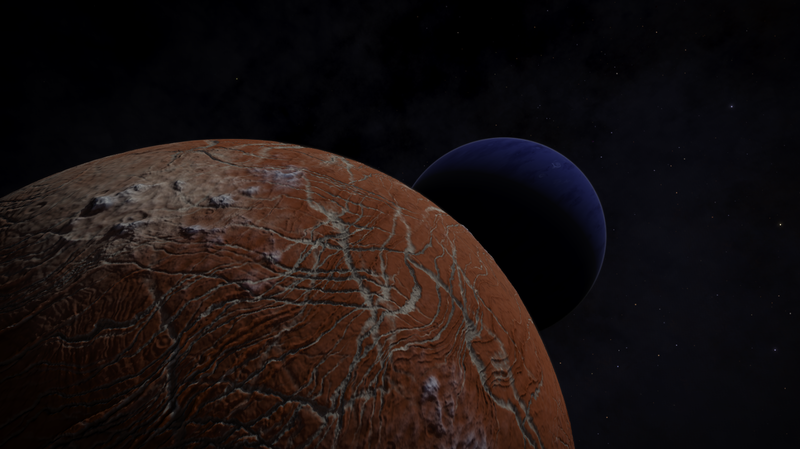 Even though these ice planets could be considered to be boring, some of them have some great surfaces. One of them, shown below, was in the one of the Swoiwns's systems and had it not had an atmosphere, I would have landed and got some shots of the mountainous regions. 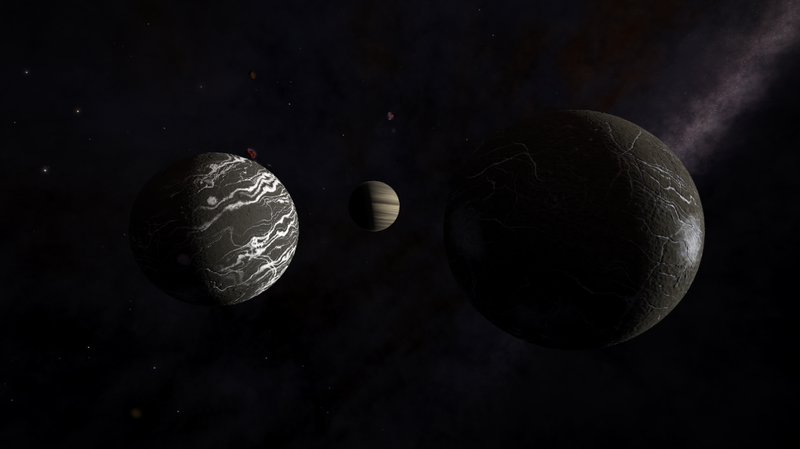 Still in the Swoiwns system, uncommon ring patterns. 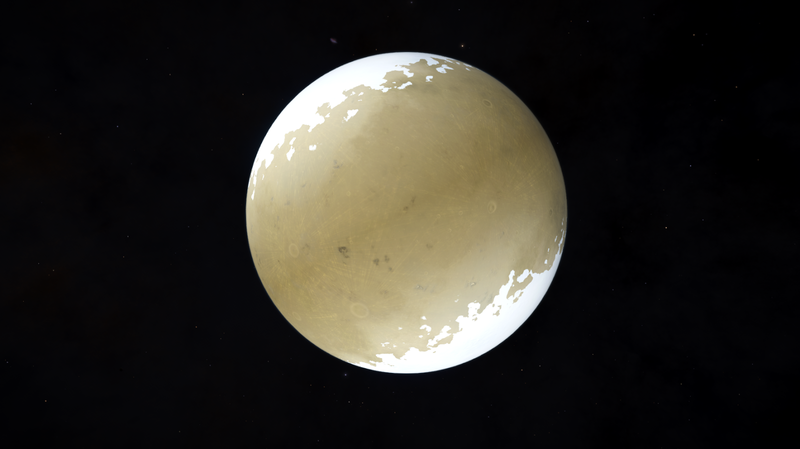 This is another ice body, but has an unusual ring pattern with distinct gaps. When I look at my screen dump directory I see that I have made just over 60. I clear this out after each post as I don't really have the disc space to clog up with images, so these are all new images from this session. I have discovered, that I have this "thang" for Blue Gas Giants, as there are quite a few of them in there. I don't know why this is, but I find them relaxing to look at, and find that these make a good backdrop for my desktop background. I appear to have a small collection of these now and no doubt I will have many more before this long excursion ends. This planet below is of the type that will gain you between 36 - 54k credits being one of these candidates for terraforming. This body has an atmosphere of Carbon Dioxide, and a make up of 66.8% rock and 33.2% metal with a gravity of 0.51G. It would make living there fun to say the least if it were to be used for habitation. 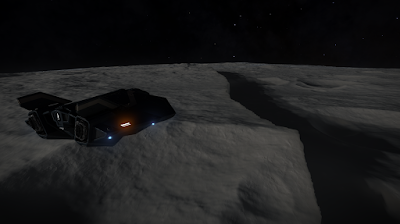 If we did move there, I doubt the beautiful ice caps would last for long, as seem to have a habit of warming things up too much. This next picture is one I have saved for a desktop background. 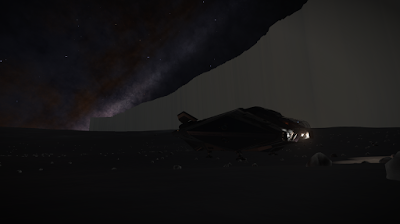 As you can see there is this blue gas giant in the background. Notice the lack of stars. The further I go out, the less dense the star field in some directions. 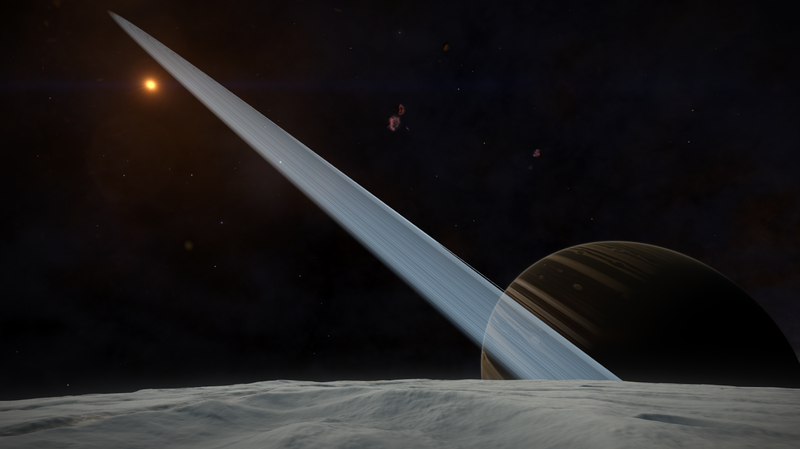 Rocky body in a close orbit with a gas giant. I nearly landed on this planet, shown above, but around 90% rock, I knew there wouldn't be many materials that I am currently looking for. Shame really as the views might have been stunning. 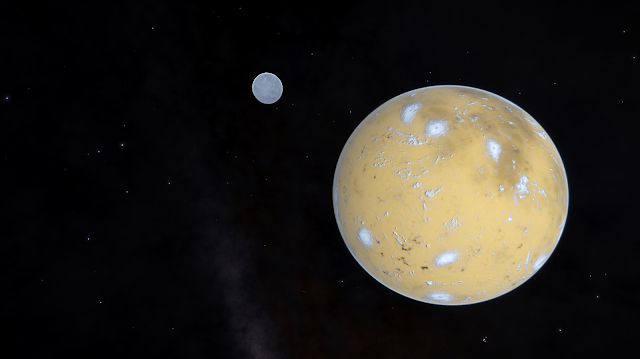 There are quite a few binary bodies in many of the systems, and sometimes you are rewarded with a pair in close proximity of a gas giant, which are very common on most systems. The shot above, is perhaps I think the best one of this session. 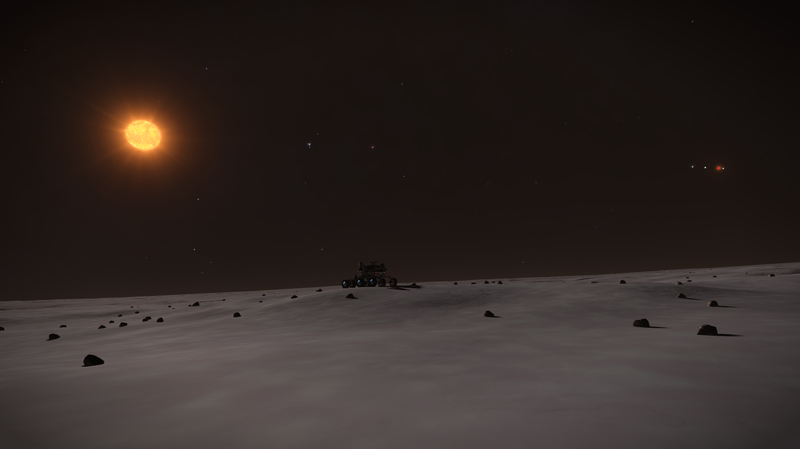 The large ice rings looked different from a distance and getting closer was rewarded by this image of seemingly cloud like ice particles. 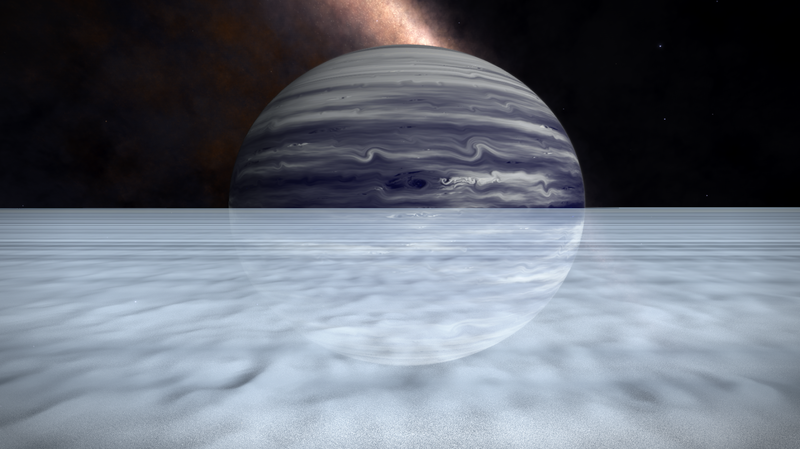 The gas giant also has a fantastic texture with a typical storm in the upper atmosphere, with a lovely wake pattern. 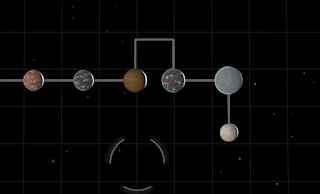 A few jumps into the Prooe Dyre star field, I came across a system that had 3 candidates for terraforming, which was a great surprise. Normally there is just the one, but 3 at once was simply great. I doubt this is a record, but certainly noteworthy. The further out I get, the more I find interesting systems. If this is the case for the future, then I cant wait to see what comes up next. The image below shows the largest system I discovered so far. It took around 20 seconds for the system map to appear, and I thought I had lost connection to the servers, but was probably due to the amount of data that was transferred together with the rendering process. Yes... I did survey each and every body. Well worth the time taken and look... lots of blue gas giants for my collection! 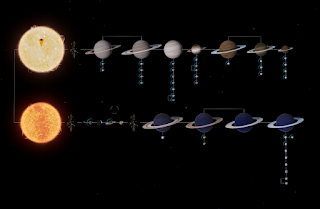 With asteroid belts, 81 objects in this system. One of these moons had Silicate Vapour Geysers, so it was worth landing on to see if I could locate any Polonium. Sadly I didn't find any, just the usual very common materials, and a little Molybdenum. I currently have enough materials for 6 of the largest jumps, but would like some more if possible. 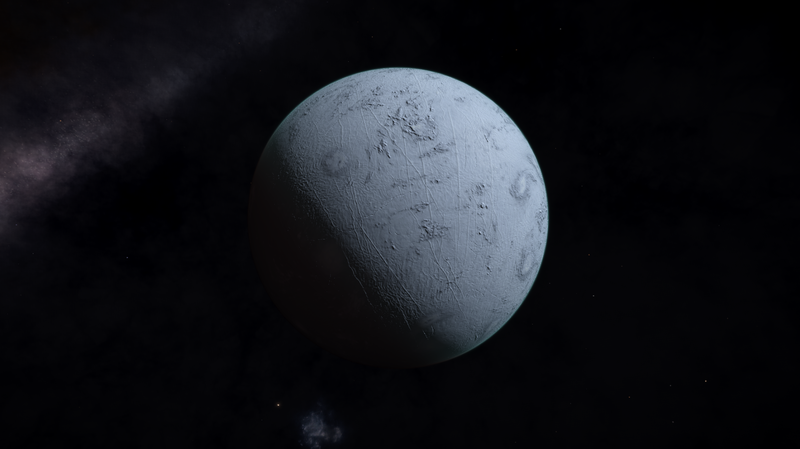 This planet looks like it has mould growths. 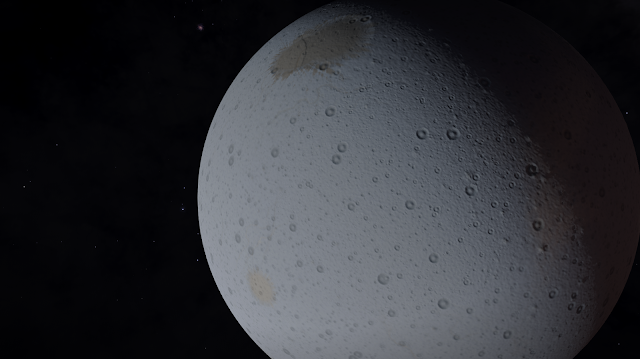 Noticeable lack of craters. Perhaps there was not a lot of asteroid activity, or perhaps lucky? A rather bruised Orange perhaps. 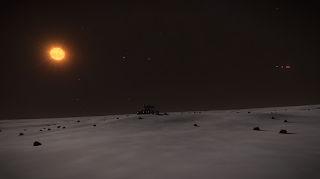 Moving into the Prae Dyre star field made a nice change as it defined another point in the expedition. This my 4th star field so far and I am sure there will be plenty more. Again there are some interesting bodies to be found. It was an amazing haul from one meteorite, but I only have enough space left for a few Polonium, so I left it there. I managed to find quite a bit of Yttrium whilst preparing for this long trip, so I already have more than enough. 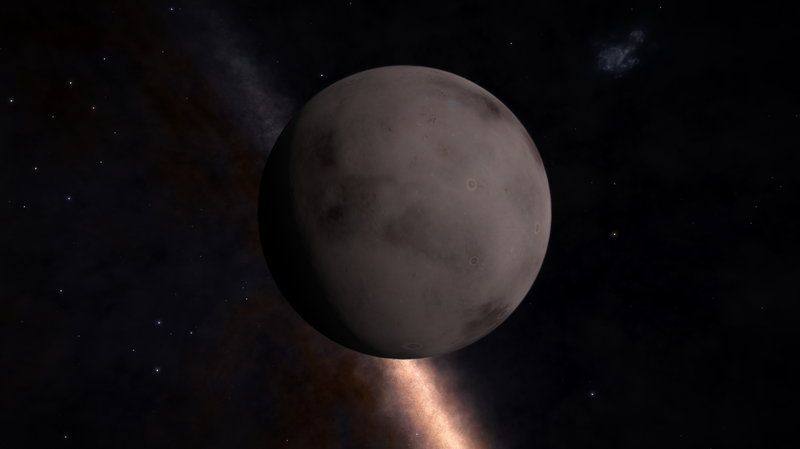 The planet next door, which was quite close, was worth a peek too, so I took some more time out for polo-hunting, (a new term for this blog). 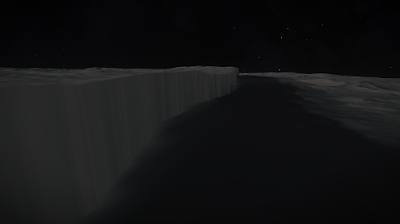 What I did find, more luck than judgement, was a deep cliff, that spanned as far as they eye could see, It was great to see such a feature, but a real shame that the side of the cliff had not been textured at all and just followed the shades that were defined in the texture above. No polonium of course. This really does seem to be most rare. Perhaps I may get lucky on another planet. 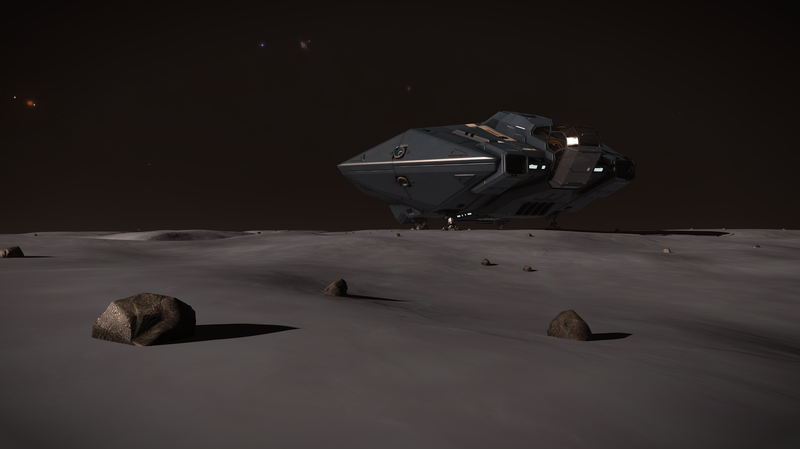 I am 18 jumps into the Prae Dyre star field, and I suspect there may be another 30 odd before I find myself in the next. As you know I have been keeping track of things using a spreadsheet, so I will be able to provide some basic statistics and analysis at some point in the near future. So watch this space. And finally... A hires screenshot of my asp. My Asp sporting the default colour scheme.